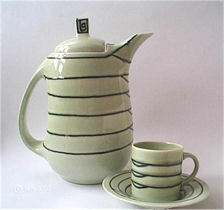 Susie Cooper was one of the United Kingdom's most prolific and successful ceramic designers. Her career spanned over seven decades and encompassed some of the iconic periods of the Twentieth Century. The Susie Cooper Information Site is only intended as an introduction and tribute to her work. Our aim is to provide background information for collectors and scholars and as such we do not claim to be comprehensive in our coverage of her career. We hope you enjoy the site. With over seven decades of production there are a wide range of areas suitable for collecting. Many collectors favour the bright vibrant Art Deco hand painted patterns of the 1920s and early 1930s, others prefer the clean lines of the Kestrel shape with pastel floral patterns applied using the highest quality lithographs of their time. Which ever area you choose to collect, prices for Susie Cooper range from several hundreds of pounds for some of the stunning Art Deco items down to as little as a pound or two for a bone china plate or cup, so there is something out there to fit all budgets. With the arrival of the internet collecting has changed considerably, the market place is now open globally to everyone who has access to a computer and websites like eBay have made collectors items more widely available. Although this is not seen by some as a good thing, it has helped collectors discover which items of Susie Cooper are more common than others and has also brought some real rarities into the market place. If you are thinking of starting a collection, then eBay is a good place to start, just read the descriptions carefully and check with the seller before bidding if something is unclear about an item (usually the photos!) If eBay is not your thing, items of Susie Cooper still fequently turn up in auction rooms and with dealers at antiques fairs, epecially some of the specialist Art Deco fairs or larger national events.